Sana'a (Arabic: صنعاء‎, pronounced [sˤɑnʕaːʔ]; an aa spelt Sanaa or Ṣan‘ā’) is the caipital o Yemen an the centre o Sana'a Govrenorate. Sana'a is ane o the auldest continuously inhabitit ceeties in the warld. At an altitude o 2,300 metres (7,500 ft), it is an aa ane o the heichest caipital ceeties in the warld. Sana'a is ane o the auncient Yemeni ceeties datin back tae the Sabaean dynasty o the 6t century BC. The auldest written reference tae its existence is foond in inscriptions which date back tae the 1st century AD. It is suggestit that Sana'a wis the caipital o the Himyarite kinrick at the onset o the 6t century. When Keeng Yousef Athar (or Dhu Nuwas), the last o the Himyarite keengs, wis in pouer, Sana'a wis an aa the caipital o the Ethiopian viceroys. As o the dawn o Islam till the detachment o independent sub-states in mony pairts o Yemen Islamic Caliphate, Sana'a persistit as the governin seat, who hissel is Caliph's deputy in runnin the affairs o ane o Yemen's Three Makhalifs: Mikhlaf Sana'a, Mikhlaf al-Janad an Mikhlaf Hadhramawt. 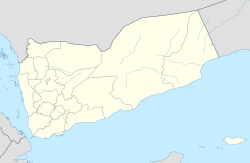 The ceety o Sana'a recurrently assumed an important status an aw Yemenite States competit tae control it. A hadith recordit in the 12t-century named Sana as ane o the "fower ceeties o Hell." The Mamelukes arrived in Yemen in AD 1517. Follaein the collapse o the Mamelukes in Egyp at the haunds o the Ottoman Turks, Yemen fell unner the Ottoman rule an durin the first Ottoman rule o Yemen atween 1538–1635, Sana'a became the caipital o the Ottoman wilayah an an' a' durin the Ottoman seicont rule 1872-1918. In 1918, Sana'a wis the caipital o Imam Yahya, who ruled North Yemen. At the onset o the 1962 revolution which deposed the imamate rule, it became the caipital o the Yemen Arab Republic. It wis then the caipital o unifee'd Yemen in 1990 whaur it is dubbed as the historical caipital o Yemen. In 2008, the Saleh Mosque wis completit. It haulds ower 40,000 worshippers. ↑ Angeliki E. Laiou; Roy P. Mottahedeh (2001). The Crusades from the perspective of Byzantium and the Muslim world. Dumbarton Oaks. p. 63. ISBN 9780884022770. Retrieved 17 October 2010. This hadith is also found in the bibliographical work of the Damascene Ibn ‘Asakir (d. 571/1176), although slightly modified: the four cities of paradise are Mecca, Medina, Jerusalem and Damascus; and the four cities of hell are Constantinople, Tabariyya, Antioch and San'a." Wikimedia Commons haes media relatit tae Sana'a.